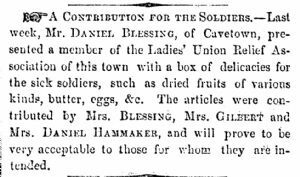 —Last week, Mr. Daniel Blessing, of Cave town presented a member of the Ladies’ Union Relief Association of this town with a box of delicacies for the sick soldiers, such as dried fruits of various kinds, butter, eggs, etc. The articles were contributed by Mrs. Blessing, Mrs. Gilbert and Mrs. Daniel Hammaker, and will prove to be very acceptable to those for whom they are intended.